Pilates is an increasingly popular form of exercise that many people are turning to in order to help improve balance and muscle tone. If you have thought about Pilates and considered doing it, but worried that you may be too old to get started, trust me when I say that you are not. You will gain a lot from getting started with Pilates, even when you are over the age of 60! As a personal trainer and fitness expert in the Pacific Northwest, I’ve helped many people to reach their fitness goals, lose weight, and just feel better about themselves. One of your highest priorities, no matter what age you may be, is to improve your quality of life and overall well being. Pilates is one of those things that can help you do just that. An exercise that people do in addition to their cardio routine, because it doesn’t provide cardio benefits, Pilates will help you improve balance. It’s also great for toning your muscles, improving muscle strength and coordination, and improving overall well being. It can help you reduce stress, combat depression, and will help to give you better posture and improved flexibility. If you are someone who suffers from arthritis, Pilates will be helpful for that as well. It has been used by many people to help reduce chronic pain that they experience from low back pain and arthritis. Pilates is especially helpful for those over the age of 60, because with the improved balance and flexibility, it can help you remain more mobile and reduce risks of injury. Falls are one of the most common problems that people over the age of 60 experience, so being able to maintain your balance better is going to provide benefits that may keep you more stable and out of harm’s way. Pilates involves a series of exercises that focus on using the muscles in slow, very controlled movements. It’s a safe and low impact way to exercise and it can be done just about anywhere. Pilates is usually offered in health clubs in group class settings, or you can get a video and do it right from the comfort of your own home. Doing it a couple of times per week, for around 45 minutes or so per class, will bring some great benefits that you will notice after doing it for a couple of months. Being over 60 should never be an excuse for not getting healthy or taking care of your body. Pilates is a great activity to add to your weekly routine, no matter what age you are. Give it a try and see what it does for you and how you feel doing it. You may just be surprised at how much stronger you feel as a result! Once you hit the age of 40, most women start to take notice of their health and weight more. They suddenly feel an urge to start getting healthy, so if that’s you, know that you are not alone. As a personal trainer who has helped many women get into shape throughout the Pacific Northwest, I have seen first-hand what dedication can do to help you reach your goals. Believe it or not yet, weight loss is not a losing battle. Let’s be real about weight loss. Chances are, you have tried numerous times in the past to lose weight, but you have had set backs. I’m here to tell you that you can overcome those setbacks and go on to lose weight and keep it off. Life happens and challenges arise, it happens to everyone, but don’t let it hold you back from starting again and continuing on to keep reaching for your goals. Create a vision. The laws of attraction work. Give some thought to what you want to look like with the weight loss. Be realistic as you are creating that vision. How do you want to look and what clothes do you want to buy? See yourself as someone without the extra weight. Forgive yourself. Yes, you have had setbacks. So what. In order to be successful going forward you must forgive yourself for the setbacks. Life happens. When you get off track you just quickly get back on track. You have to realize that we are not our behaviors from a few setbacks. If you were driving down the road and made a wrong turn on your way to your destination you wouldn’t give up. You’d get back on the right course. With your weight loss you have to do the same thing. Prioritize goals. This has to be a top goal and you need to define why it’s important to you. Write it down, own it, and keep it nearby. Remind yourself daily why it is that you want to lose weight. Take action. Every day remind yourself of what your goal is and then take steps to make it live. Keep the goal alive every day by taking action. Small steps every day in the right direction will get you there over the long term course. Celebrate success. Many people are quick to point out their setbacks and beat themselves up over them, but they don’t celebrate their successes. Take the time to celebrate your successes and milestones. You deserve the recognition, so be sure to take it. Weight loss for women over 40 may be slightly more challenging, but it’s way more important. You have reached an age where you have to get serious about taking care of your body so that it continues on for decades more and you reduce your risks of common diseases, such as heart disease and diabetes. Weight loss is a challenge that you can take on and beat! Pilates for People over 50 Years Old: It’s not too late to start! If you are over the age of 50 and considering Pilates, don’t shy away from it. Many people wonder if they are beyond a good age to get started with such a workout program. Trust me when I say that being over the age of 50 should never slow you down and keep you from joining in on the benefits of Pilates. As a fitness expert and personal trainer who has helped many people over the age of 50 throughout the Pacific Northwest, I have many clients who do Pilates. While some wonder if they are too old to get started, they quickly realize they are not once they get going. There are a lot of good reasons to take up Pilates, and you are never too old to gain those benefits. Pilates is a low-impact exercise that focuses on strength and stability. It’s an ideal form of exercise for older people, because it is low impact and easy to do. Pilates focuses on posture, muscle strength, and balance. Most classes are 45 minutes to an hour in length, and you can do it in a class at a club or you can do it from the comfort of your own home, by using a DVD. You can even download a Pilates app for your phone, so you can do it on the go and wherever it is convenient for you. Some of the benefits that Pilates offers is that it helps to make you stronger, helps sculpt and tone your muscles, improves flexibility and balance, improves posture, and provides an overall sense of wellbeing. It’s a safe exercise that some find brings relief from chronic paid brought on by arthritis and low back pain. Pilates can help to improve your fitness level overall, but it is not a substitute for doing cardio workouts. Pilates is not a cardio exercise, so you will still need to do this in addition to having a cardio routine. Ideally, you should try to fit in Pilates twice per week, in between the days you do your cardio workout. Whether you plan to give Pilates a try from your home, or you decide to take a class at the gym, it’s a great way to give your body some attention. You are never too old to do this gentle form of exercise, and you will be glad that you did it. Everyone, no matter what age they are, needs to have an exercise plan that will keep them moving and becoming stronger. If you are over the age of 45 and wondering whether or not you can benefit from exercising, you have come to the right place. As a fitness expert and personal trainer in the Pacific Northwest, I have helped countless people over the age of 45 to get fit and reach their goals. What I have also noticed along the way is how many people doubt their capabilities, and just exactly what they can do. They believe they are too old to get started. That is absolutely false. You are never too old to get started with an exercise plan or fitness routine. Whether you are 15 or 50, it’s a good idea to have a routine that keeps you physically fit. Never let age hold you back from getting started being healthy. They believe they won’t benefit from their efforts at their age. Many people feel that the damage of their slack lifestyle has already been done and that it’s too late to reverse that. Not true! If you start exercising, you will turn things around and be able to achieve your fitness goals. Many people over 45 feel they don’t need to exercise. While some think that heart disease and other problems associated with sedentary lifestyles are something that happens to other people, they don’t see themselves as at risk. They may feel they are just fine the way they are. The truth is that whether you are skinny or overweight, you still need to be physically active in order to maintain good health. Everyone needs to exercise. Some believe that exercise is dangerous. Fearing they may get injured, they hold back and take a seat on the couch. Well, there are more risks in sitting around and being sedentary than there are in getting up and exercising. Sure you want to take measures to be safe and reduce risks of falls and injury, and you absolutely can! They believe they are in too poor of health to start exercising. That’s simply not true for most people. You always want to check with your doctor to get the clearance for starting a new fitness routine, but most people can exercise. You may need to start small, start slow, and start with where you are and work your way up. If you are over 45 and want to start exercising and getting fit, it’s time to look past the myths and excuses. You can achieve your goals! Just make the commitment to get started, have a sensible plan, and stay the course. I’ve helped many people just like you, and I can help you, too! Yoga for Older Women Beginners – You can do that! If you are an older woman who is interested in getting started with yoga, good for you! Many people who are older are interested in yoga, but they fear that they missed the boat when it comes to starting. They feel that if they are older and didn’t do it when they were younger, that maybe they should skip it all together. I’m here to say just the opposite! As a personal trainer and fitness expert in the Pacific Northwest, I have helped many older women (and men) to realize their fitness goals. I have worked with enough of them and long enough to know that they often place limits on themselves because of their age. They may be interested in trying something, such as yoga, but shy away because it’s new to them. No matter what your age is, you are never too old to get started with yoga. You can absolutely do it and enjoy every moment of it! Yoga for beginners is perfect for those who are older and want to give it a try. There are several types of yoga, with Hatha being the most common type in the U.S. When you are looking for a class to try, or a video to use, opt for one that says it is ideal for beginners. This will help you ease into a class, so you can get a taste of what it’s like. Keep in mind that you won’t always be a beginner, so before long you will be able to advance to other yoga classes. Finding a yoga class is not difficult, because today they are offered in many places. You can find them in senior centers, health clubs, and even dedicated yoga houses. If you prefer to do the yoga from home, you can do that as well. With a good yoga DVD, you can enjoy yoga right from your own living room, saving you time and money, while still gaining the benefits. Often times, the hardest part about beginning something new, such as yoga, is just taking that first step. In your mind, you build up this image of what it will be like, often creating fear where there shouldn’t be any. Once you get into the class, that fear fades away within minutes and then you will soon feel comfortable. Going back for the second class will be a breeze. Take the first steps and find a beginner program for you to give a try. The benefits you gain from doing the yoga will keep you going back for more. Everyone benefits from doing yoga, including those who are older, and often times especially those who are older. Yoga for Older Women – Let’s get started! If yoga is something that has seemed like a mystery to you, then you are not alone. While many people hear the word yoga, they don’t always know what it is and whether or not it’s something they should even attempt. Forget worrying about what it takes to strike a pose, and just give yoga a chance. You may be pleasantly surprised at what it can do for you! As a personal trainer who has helped many older women in the Pacific Northwest area to achieve their fitness and weight loss goals, I know plenty of women who have overcome their fear of yoga to give it a try. What they usually find out is that it’s something they truly enjoy and it elevates their quality of life. The more you learn about yoga and incorporate it into your life, the more you may also become a yoga fan. Without a doubt, you will reap the benefits of including it into your routine. Yoga is a mind/body practice and is one that has an ancient history that comes from India. While there are several types of yoga, the most common one that is performed in America is Hatha yoga, which is based on using a series of postures and breathing exercises. 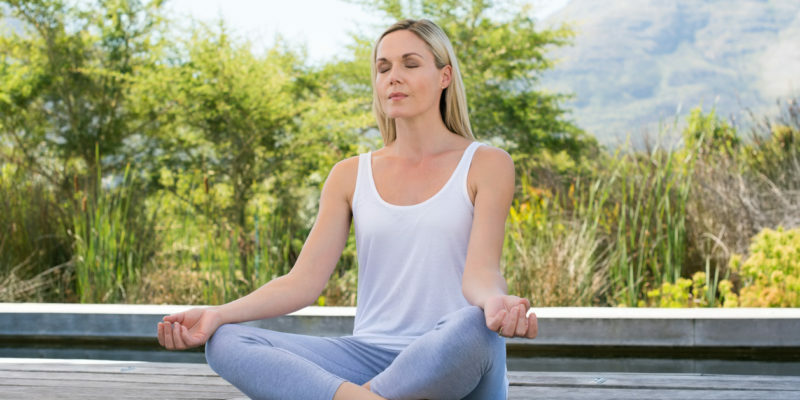 Not only is it something that can be relaxing and help you de-stress your life, but it is considered by the National Institutes of Health to be one of the top 10 complementary and integrative health approaches used among adults in the country. There are numerous health benefits that come from doing yoga regularly. The health benefits include that it helps to reduce your heart rate and blood pressure, helps combat depression, helps asthma, and may even be beneficial for arthritis. It’s also been shown to help bring about relief from chronic low back pain and some other painful conditions that people experience. At this point, you may be wondering if, being an older woman, you are past the age of getting into yoga. Not a chance! One of the great things about doing yoga is that there is no right or wrong age for it. Yoga is something anyone and everyone can do. There are children who do it and there are senior citizens who do it. Yoga is for everyone. Never let age hold you back from getting involved in exercise and wellness programs. The rewards and benefits of them are too great to pass up. If you are ready to give yoga a try, look around for a class in your area. They are often offered at parks and recreation departments, senior centers, health clubs, gyms, and at yoga houses. Try a couple of instructors and types of yoga to find the one that is a good fit for you. Your body will be glad you did! I’m always excited when older women want to take control of their health and fitness and get exercising. In fact, my career is dedicated to helping men and women do just that. As a personal trainer in the Pacific Northwest, I’ve helped many older women to reach their fitness goals, and I look forward to helping many more do the same. If you are an older woman who would like to start an exercise routine, you have come to the right place! Make the decision. If you are here, there’s a good chance the decision has been made. Good for you! If you are in good health, you may be able to just go right into an exercise program. If you are unsure about it or feel you have some health problems, always start by running it past your doctor to make sure you get the thumbs up to get started. Strength train. 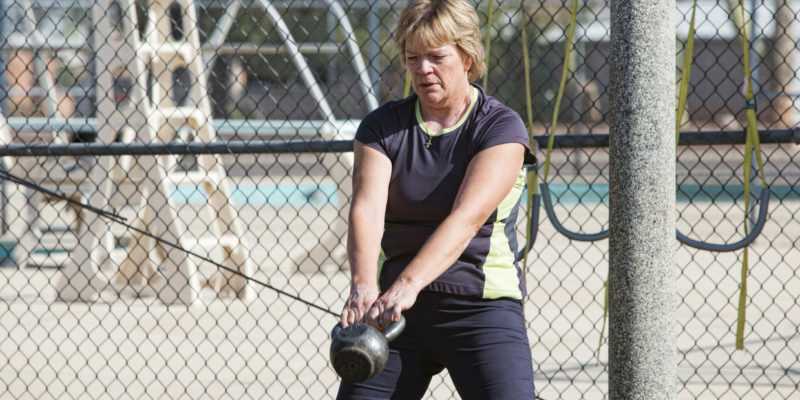 Many people try to overlook the importance of strength training, but it is important, especially for older women. It will help to improve strength, balance, mobility, and keep you stronger. Strength training will help to improve your overall functioning. 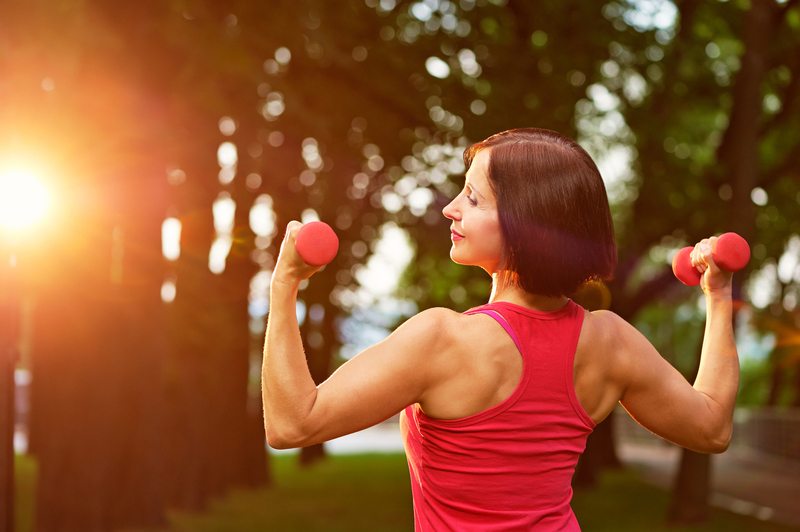 Opt for lifting or pushing weights at home or at the gym twice per week, for 30 minutes each time. Always start at a low weight and gradually work your way up to adding more. Muscle strengthening exercises can also include digging in the garden, using exercise bands, and some yoga and Tai Chi exercises. Get cardio, too. Getting cardio exercise will help to keep your heart healthy and reduce risks of getting a host of other diseases and ailments. Plus, it keeps you feeling good mentally and physically. Ideally, you should shoot for getting 150 minutes of moderate intensity exercise, such as brisk walking, jogging, or swimming, or get 75 minutes per week of high intensity exercise, such as running. Choose a cardio exercise that you enjoy and will look forward to doing each week. Additional cardio exercises you could consider include tennis, bike riding, water aerobics, dancing, hiking, and golf (without using a cart). Taking care. Be sure to properly warm up before exercising and to do a cool down and stretch afterward. This will help to protect your muscles from injury and make your efforts during exercise go smoother. Properly exercising for older women focuses on doing things that will help to keep your body healthy, and will take measures to reduce risks of injury. Always start out low and slow and gradually work your way up to taking on more as you become stronger. Getting plenty of exercise will help to keep you feeling great, improve your balance, and help you have a better quality of life. Exercise is always worth the effort! If you are a woman over the age of 50, you may have noticed that there are a couple of extra pounds that have crept up on you. While you may not appreciate that extra weight, you may take comfort in knowing that you are not alone in that happening. As we age, our metabolism tends to slow down, and we slowly start adding weight each year. The good news is that it is never too late to do something about it! Once you reach the age of 50, you really need to make healthy eating and exercise a priority. This is especially true if you have been going through prior decades not being committed. Don’t feel ashamed about it, either. A good portion of women in your age group have done the same thing. But now is the time to kick it into high gear, take control of your health, and get fit and healthy. Weight gain and loss is about energy. Every bite of food you consume is considered energy, as is every calorie you burn from exercise and by just existing. If you take in more calories than you burn, they will be stored as fat. Take in less, and you will pull from your fat reserves to use energy, and it will lead to a weight loss. Don’t try to lose more than 1-2 pounds per week. Losing weight at only 1-2 pounds per week is a healthy way to lose weight, and you will be more likely to keeping it off. Forget the fad diets and quick-fix plans. What leads to healthy weight loss is a permanent lifestyle change. You have to be committed to losing weight and being healthy. Opt for whole foods that are prepared at home, sticking with lots of fruits, vegetables, whole grains, and lean protein sources. Keep dining out to a minimum, because most of the time it is loaded with sugar, sodium, and fat that you can’t see, but has an impact on your health. Stay well hydrated. Be sure to drink plenty of water each day. Develop an exercise routine that you enjoy. Ideally, you should be getting 75 minutes per week of vigorous intensity exercise (running) or 150 minutes of moderate intensity exercise (brisk walking) per week. Additionally, you need to get two days in of muscle strengthening exercises, focusing on various muscle groups. If you stick with those guidelines, you will see the pounds gradually shed and you will look and feel great. Many people find it helpful to keep a food diary to keep them on track, and some put their exercise on their calendar. Do what you must to stick with it and stay committed. As a personal trainer, I have worked with many women over the age of 50 throughout the Pacific Northwest, helping them to achieve their weight loss and fitness goals. Weight issues have become a major concern in America, including the Pacific Northwest where as a personal trainer I have helped many people to lose weight and get into shape. In fact, the Centers for Disease Control and Prevention, reports that nearly 71 percent of adults in the country over the age of 20 are either considered overweight or obese. The good news is that the extra pounds don’t have to be a life sentence, there are things you can do to lose weight, even when you are over 50. Once you reach about the age of 50, your metabolism slows down some and you begin to lose a little muscle mass each year. But that doesn’t mean you have to take a weight gain or be stuck unable to lose weight, it just means you need to know how to go about losing weight now that you are over 50. Stop skipping breakfast. You are not saving calories, because you are likely consuming more later in the day to make up for it. But you need the energy from breakfast. It really is an important meal to get in every day. Opt for something that has a good source of protein, which will help keep you from getting hungry sooner. Look at your plate differently now that you are over 50. When you load it up with food, fill half of it with fruits and vegetables. Yes, half of your plate should be filled with nutritious fruits and vegetables. The rest can come from things such as lean protein sources and whole grains. It’s time to up your fiber game. Getting plenty of fiber is a great way to help stave off hunger and to help you lose weight. It is recommended that you get around 30 grams of fiber per day. Start focusing on getting 30 grams per day and you will likely start losing some weight when you consistently hit that mark. Fiber is only found in plant-based foods, so aiming for the 30 grams or more will keep you eating lots of fruits, vegetables, and whole grains. Keep tabs on how often you are eating food out of the house. The food in restaurant is typically loaded with sugar, fat, and sodium. Start minimizing the number of times per week and month that you dine out, opting instead for home cooked whole foods meals. Change your snacks. Some snacks, such as nuts, seeds, and fruit, will keep you feeling energized and give you nutrition. Other snacks, such as chips, cookies, and candies, will do just the opposite. Swap out your fats. Give your body the healthy fats, such as avocado, nuts, and seeds, and get rid of or greatly limit the ones that are unhealthy, such as trans fats and saturated fats. Trans fats are found in processed cookies, crackers, and snacks, while saturated fats comes from animal products. Aim to lose about 1-2 pounds per week and not more than that so you are losing it safely. Also, along with your dietary changes, add in a regular exercise program that includes cardio and strength training. Stay committed and you will lose the weight!